AUCKLAND (Pacific Media Watch): A Tongan journalist educated at the University of the South Pacific and a New Zealand-born Samoan have won the two inaugural Pacific media scholarships at New Zealand's Auckland University of Technology. Kitekei'aho Tu'akalau, a 29-year-old reporter with the Auckland-based Taimi 'o Tonga, has won a scholarship for postgraduate studies at AUT's School of Communication Studies. He graduated with a BA in geography and education at the Suva-based USP in 1997 and two years later gained a Postgraduate Diploma in Geography, also at USP. After working as head of geography at St Andrew's School in Tonga, Tu'akalau joined the Auckland staff of Taimi 'o Tonga, a leading community and investigative paper in the Pacific. An 18-year-old New Zealand-born Samoan from Onehunga High School, Leilani Momoisea, won the undergraduate scholarship for the Bachelor of Communication Studies programme. A winner of a B bursary, Momoisea had worked for a year in a McDonalds restaurant in Auckland after leaving school to save for an opportunity to take up journalism as a career. Teachers described her as a "sophisticated writer with superb written ability to match her ideas". She is also a gifted netball player and accomplished in theatre, church and cultural activities. Associate Professor Barry King, head of AUT's School of Communication Studies, presented the scholarships at last week's Pacific Islands Media Association (PIMA) conference. The AUT scholarships are being awarded annually through the initiative and support of PIMA. PACIFIC MEDIA WATCH is an independent, non-profit, non-government organisation comprising journalists, lawyers, editors and other media workers, dedicated to examining issues of ethics, accountability, censorship, media freedom and media ownership in the Pacific region. 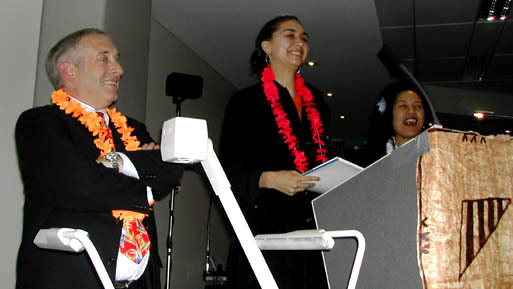 Launched in October 1996, it has links with the Journalism Program at the University of the South Pacific, Bushfire Media based in Sydney, Journalism Studies at the University of PNG (UPNG), the Australian Centre for Independent Journalism (ACIJ), Auckland University of Technology in New Zealand, and Community Communications Online (c2o). © 1996-2002 Copyright - All rights reserved. Items are provided solely for review purposes as a non-profit educational service. Copyright remains the property of the original producers as indicated. Recipients should seek permission from the copyright owner for any publishing. Copyright owners not wishing their materials to be posted by PMW please contact us. The views expressed in material listed by PMW are not necessarily the views of PMW or its members. Recipients should rely on their own inquiries before making decisions based on material listed in PMW. Please copy appeals to PMW and acknowledge source.